The new version 3.01 of ReplyButler is available and introduces several nice new features. Now it’s not only possible to set the subject or add attachments using a text module, but you can also add CC or BCC. As a second new feature, you can now automatically include the first line from a text file into your boilerplate text (e.g. for a personal promo code). Administrating the text modules has become easier, too. Now they’re not only available as menu, but the sidebar also shows them in a tree view. The update and all information about the program can be found on the product page: ReplyButler – Text modules for Outlook. When answering customer e-mails it’s often helpful to quote URLs for more information. 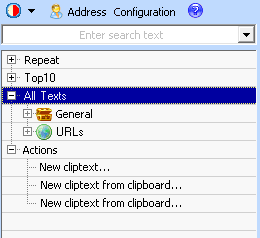 To avoid typos, you can use ReplyButler’s text module engine to store them nicely in menus. And now comes the interesting part: If your website is multi-language, you can store multiple URLs (pointing to the same page, but in different languages) in the same text module. It’s still just one text module. Just one item that you have to click on. But ReplyButler knows that there’s more than one URL and will use the URL that you have entered for the language that was used in the current e-mail. The question remains, but the answer was just updated. The new version offers an improved support for netbooks with a low screen resolution and allows to “freeze” the list. If you’re wondering what you computer is doing, you can find the answer here.